Biotic Potential What would happen if no limiting factors restricted the growth of a population? Think about a population that has an unlimited supply of food, water, and living space. The climate is favorable. Population growth is not limited by diseases, predators, or competition with other species. Under ideal conditions like these, the population would continue to grow. The highest rate of reproduction under ideal conditions is a population's biotic potential. The larger the number of offspring that are produced by parent organisms, the higher the biotic potential of the species will be. Compare an avocado tree to a tangerine tree. Assume that each tree produces the same number of fruits. Each avocado fruit contains one large seed. Each tangerine fruit contains a dozen seeds or more. Because the tangerine tree produces more seeds per fruit, it has a higher biotic potential than the avocado tree. Birthrates and death rates also influence the size of a population and its rate of growth. A population gets larger when the number of individuals born is greater than the number of individuals that die. When the number of deaths is greater than the number of births, populations get smaller. Take the squirrels living in New York City's Central Park as an example. In one year, if 900 squirrels are born and 800 die, the population increases by 100. If 400 squirrels are born and 500 die, the population decreases by 100. The same is true for human populations. Table 1 shows birthrates, death rates, and population changes for several countries around the world. In countries with faster population growth, birthrates are much higher than death rates. In countries with slower population growth, birthrates are only slightly higher than death rates. In Germany, where the population is getting smaller, the birthrate is lower than the death rate. Figure 9 Mangrove seeds sprout while they are still attached to the parent tree. Some sprouted seeds drop into the mud below the parent tree and continue to grow. Others drop into the water and can be carried away by tides and ocean currents. When they wash ashore, they might start a new population of mangroves or add to an existing mangrove population. Moving Around Most animals can move easily from place to place, and these movements can affect population size. For example, a male mountain sheep might wander many miles in search of a mate. After he finds a mate, their offspring might establish a completely new population of mountain sheep far from the male's original population. Many bird species move from one place to another during their annual migrations. During the summer, populations of Baltimore orioles are found throughout eastern North America. During the winter, these populations disappear because the birds migrate to Central America. 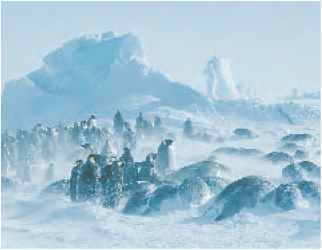 They spend the winter there, where the climate is mild and food supplies are plentiful. When summer approaches, the orioles migrate back to North America. Even plants and microscopic organisms can move from place to place, carried by wind, water, or animals. The tiny spores of mushrooms, mosses, and ferns float through the air. The seeds of dandelions, maple trees, and other plants have feathery or winglike growths that allow them to be carried by wind. Spine-covered seeds hitch rides by clinging to animal fur or people's clothing. Many kinds of seeds can be transported by river and ocean currents. 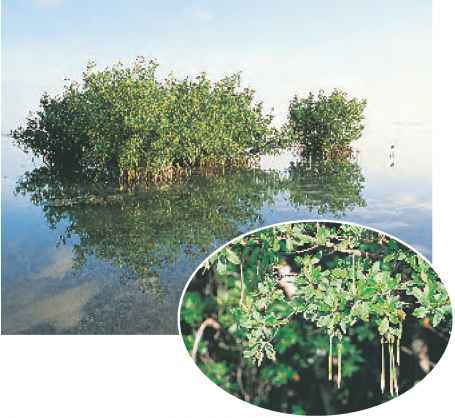 Mangrove trees growing along Florida's Gulf Coast, shown in Figure 9, provide an example of how water moves seeds. 1. Remove all the seeds from a whole fruit. Do not put fruit or seeds in your mouth. 2. Count the total number of seeds in the fruit. Wash your hands, then record these data in your Science Journal. 3. Compare your seed totals with those of classmates who examined other types of fruit. 1. Which type of fruit had the most seeds? Which had the fewest seeds? 2. What is an advantage of producing many seeds? Can you think of a possible disadvantage? 3. To estimate the total number of seeds produced by a tomato plant, what would you need to know?